That focused attitude about his craft has led to a series of smile-inducing delights across multiple albums, beginning with a trio of themed projects known as The Alphabet Songs Series, the critically acclaimed album “Dandelion, and the collection of lullabies “Once I Lived Upon the Sea””. More recently, Weeks has issued “Wish You Were Here”, a CD intended to thank everyone who has helped him over the years in achieving his goal of performing in all 50 United States. Weeks has long been known for his richly layered acoustic-based songs, experimentation with unusual percussion (including cans, pots and pans, even tinker-toys) and diverse musical styles that range from reggae to bluegrass to folk-hop. But at the heart of his music is always an outlandish story or a touching tale. His latest work is no exception. Weeks, who placed first (with his song “Up!”) in the children’s music category of the 2007 U.S. Songwriting Competition, boasts four tracks that have reached No. 1 on Sirius XM’s Kids Place Live. In part, that national success is due to the fact that Steve's music doesn't leave adults out in the cold. 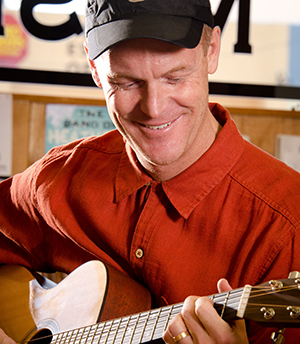 Woven throughout his songs are heartfelt messages and stories that young and old alike can appreciate. “Tiny House” weaves a lovably absurd story of downsizing, and “Monday I Woke Up Purple” tells of a protagonist who wakes up completely different every morning. “Run-On” is literally a single run-on sentence, and “Backwards Song The” is, wellâ€¦ backwards. As always with Steveâ€™s music, youâ€™ll also hear catchy melodies and warm instrumentation. “A Raindrop for Me” is an endearing tale of thankfulness that starts with a single drop of rain, and the infectious “Baby Started Dancing” will have you up on your feet just like characters in the song. Listeners have responded. After the national recognition that Alphabet Songs, Dandelion, and Once I Lived Upon the Sea received, Wish You Were Here arrived to overwhelming praise, proof that Weeks is an artist who’s here to stay.